Dr. Papan is proud to be the owner of Loving Paws Animal Hospital. Dr. Papan is a Florida native and graduated from North Port High School in 2005. She attended St. Matthews University School of Veterinary Medicine and completed her clinical year at Purdue University. After graduating in 2012, Dr. Papan stayed in the Indiana and Illinois area working mainly at humane societies and non for profit organizations. In 2016, Dr. Papan decided to move back home to sunny Florida and has owned Loving Paws Animal Hospital since September 2017. 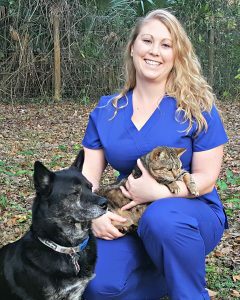 Dr. Papan has a strong passion for preventative medicine, feline medicine, and spay/neuter surgeries. When not at work, Dr. Papan enjoys spending time with her four-legged children (which include 2 horses, 1 rescue dog and 4 cats), playing softball, paddle boarding and cooking.